Inflation is at nearly 5%, before the impact of the VAT rise. Meanwhile public sector workers suffer a two year pay freeze, potentially a real terms cut in income of around 10%. Private sector workers are averaging 2% pay settlements, and so are suffering a real terms cut too. Osborne’s Budget and Spending Review slashed £18bn from welfare, while pensions will be reduced by shifting their uprating from RPI to the CPI, so those on welfare and pensioners are also facing cuts in their disposable income in 2011. He’s announced over £80 billion in public sector cuts, while unemployment continues to rise. ‘Don’t worry’ says George, because the private sector is coming to the rescue – and to encourage them Osborne announced £24 billion in business tax cuts in the Emergency Budget in June 2010. The Budget announced a 4% cut in corporation tax from 28% to 24%, a higher threshold for employer NI contributions and employer NI exemptions for new businesses, and a cut in the small business rate of tax. This is the Osborne economic strategy: the public sector is too big, and is ‘crowding out’ the private sector. The Conservative narrative is that over-spending in the public sector caused the crisis and cutting it will allow the private sector to flourish – and the economy to revive. Like George, this strategy is simple and discredited. Leaked papers from his own ‘independent’ Office for Budget Responsibility (OBR) in June 2010 showed that if 600,000 public sector jobs were cut the knock-on effects would mean 700,000 private sector jobs would be lost. In the Comprehensive Spending Review, Osborne said that actually only 490,000 public sector jobs would go. However, the Chartered Institute for Personnel and Development looked at his figures and estimates that in fact there will be 725,000 public sector job losses as a result of the £80billion-plus cuts. It’s not just the OBR that’s sceptical either. David Leigh, IMF economist, said “we should not kid ourselves. In the short term, tax hikes and spending cuts will reduce growth and raise the unemployment rate”, before adding “in today’s environment, fiscal consolidation is likely to have more negative short-term effects than usual”. The Nobel laureate and former World Bank chief economist, Joseph Stiglitz, said in December that current policies meant “a slower recovery and an even longer delay before unemployment falls to acceptable levels”. Unemployment rose to 2.5 million in December – it was the first rise in six months, and was swiftly followed by a further rise in January 2011. Long-term unemployment (those unemployed 12 months or more) is now at its highest since February 1997 and youth unemployment, at over 20% of 16-25s, is the highest on record. Public sector job losses are only just beginning to feed through, yet there is no sign of private sector demand compensating. The other problem for Osborne’s ‘don’t crowd out the private sector’ slash and burn policies is Ireland. The public sector has been slashed (services, jobs, pay and pensions), corporation tax is lower than almost anywhere else in Europe, and the economy is in a death spiral. In fact, if you want to see what the future holds for the UK economy under Osborne’s economic theory you don’t need to look at a crystal ball, you need to look to the Emerald Isle. This is because Osborne’s ‘crowding-out’ theory is just plain wrong. And wrong on two counts: the public sector didn’t cause the crisis; and secondly, and more importantly, cutting the public sector will not solve the economic crisis. If anything, it will worsen it. I doubt that George fails to grasp this, but despite the negative consequences of his policies, especially for unemployment, corporate Britain is doing very nicely. Corporate profits are recovering nicely, especially in the banking sector where margins have expanded impressively, and the stock market is buoyant. Due to the shortage, house prices have remained relatively stable (they have fallen around 40% in Dublin and over 50% in some US cities) even if the market is subdued, while executive pay is skyrocketing. Yes, 2011 will be a good year for the people that matter to George. The Governor of the Bank of England, Mervyn King has assured us that unemployment will rise and the value of wages will fall as inflation lets rip, leading to the most dramatic assault on living standards since the 1920s. What’s more, you’ll be pleased to know, it’s absolutely necessary. This is the price we are obliged to pay, says King, to smooth the path to growth and economic recovery. In actuality, it’s the consequence of failed attempts to stave off the deepening recession and confirms that they don’t have a clue what to do, apart from the usual capitalist remedy of increasing exploitation and the share of national wealth that goes to the ruling classes. It’s a similar story across the Atlantic as the rate of repossessions accelerates, driving millions of families from their homes and unemployment touches 10%. President Obama used his annual State of the Union address to warn that the US must mobilise to meet the “mortal threat of foreign competition from China and India”. He is proposing to reduce government spending to the lowest share of the US economy since the 1950s. Despite renewed attempts to rehabilitate the policies of Keynes – who favoured higher spending in a recession – the crash of 2007-8 means that, for capitalism, the era of high levels of government spending is over. Are these programmes of slashing cuts “ideological”? Yes indeed, they manifest the ideology of those whose job it is to sustain a society devoted to profit at the expense of the majority of people on the planet, and the planet itself. Throughout the relatively short period in which capitalist production spread across the world, its inner dynamic forced its human agents to find ways to counteract the relentless tendency for the rate of profit to fall. Investing in technology to increase productivity is one. Forcing wages down another. Together they lead to increases in productive capacity and the volume of goods and services. They call it “growth”. Pretty soon production expands beyond the available marketplace of consumers. And then credit comes into play, stretching things beyond their “natural” limits – for a while. Then comes the crash. Surplus productive capacity is eliminated, and the process starts up, once again. This time there’s a difference. The period of growth called “globalisation” consumed the world’s natural resources at an exponential rate. Corporations spread production throughout the world by recklessly burning fossil fuels, unlocking energy and releasing it into the atmosphere and so intensifying weather patterns. 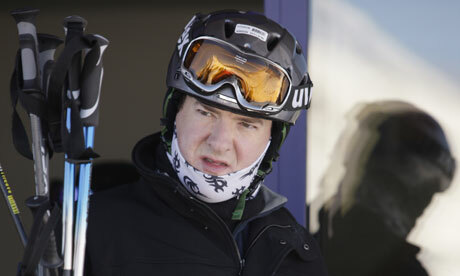 Early snow in Britain helped to reduce national output by an estimated 0.5% in the last three months of 2010. Floods in Pakistan and Queensland, Australia wiped out crops. Nature mocked capital as the floodwaters wrecked the extraction of coal. But capital’s human agents are blind to these effects. They are tied into the historic logic of profit from which they cannot escape. Sir Richard Lambert, outgoing chief of the Confederation of British Industry accused the Coalition of having no strategy for growth. But the Cameron-Clegg branch better reflects the needs of capital at this point in history. They are hell-bent on cutting the deficit, reducing capacity, shrinking incomes, eliminating jobs and services – every action aimed at facilitating the contraction without which “recovery” is impossible. Rather than allow the destruction of the valuable results of a couple of centuries of human endeavour, it falls to the rest of us to bring the destructive system to an end before it threatens to end the conditions for life on the planet. In the process of building a global network of people’s assemblies we can establish democratic stewardship of the world’s resources, utilising and advancing the science and technology for sustainable production, and setting ourselves the task of converting it to satisfy the needs of the majority. Yes, the snow had an impact. Undoubtedly. But even without it the ONS concedes that 'growth' would have been "flattish", i.e. no growth. The reality is that George Osborne's own 'crowding out' explanation for the crisis and recovery strategy (as previously denounced by LEAP) undermined the economy in Q4 of 2010. As I said when speaking to reps from the Northern Irish public sector union (NIPSA) earlier this month, there are 3 problems with Osborne's economic strategy (you can download my powerpoint presentation from the NIPSA website). Firstly, is Osborne's own 'independent' Office for Budget Responsibility, which said in June 2010 that if 600,000 public sector jobs were cut, the knock-on effects would mean 700,000 private sector jobs would be lost. In the CSR in October he said that actually only 490,000 public sector jobs would go. However, the Chartered Institute for Personnel and Development looked at his figures and estimates that in fact there will be 725,000 public sector job losses as a result of the £80billion cuts. Secondly, unemployment is rising. Long-term unemployment (those unemployed 12 months or more) is now at its highest since February 1997 and youth unemployment is the highest on record. The private sector is not 'crowding in' to the space left by the public sector. Thirdly, Ireland. What Osborne is implementing in the UK has been tried in Ireland: it doesn't work. The public sector been slashed, corporation tax is lower than almost anywhere else in Europe and the economy is in a death spiral. In Q1 of 2011, we have the VAT rise, rising inflation, rising unemployment and declining capital spending from central and local government to impact on the figures. And there's be no snow for George to hide behind. Palgrave Macmillan have republished Geoff Tily’s “Keynes Betrayed” in paperback. This is an important book because it contradicts so much of the perceived wisdom over Keynes’s policy prescription. And it should be stressed, the errors of understanding Keynes are committed by economists on both sides of the spectrum – right and left – as well as a good chunk of those sitting in the middle. Keynes was far more concerned about monetary issues than fiscal policy. Unfortunately, most cursory reading of Keynes simply focuses on the General Theory, which was written in 1936. Even then, too many readers of this important book fail to appreciate the chronology of policy advice Keynes was offering in the 1930s – monetary first, fiscal second. Indeed, Keynes made an enormous – and positive contribution – to policy long before the General Theory was published, as Geoff Tily shows commendably in this book. "Keynes's central policy priority was a permanently reduced long-term rate of interest", Tily argues. Keynes was a leading proponent of central bank long-term asset purchases – today called quantitative easing (QE). Furthermore, he was quite clear about the problem within bond markets which made QE necessary, as shown by his liquidity preference theory. Keynes also understood the importance of targeting the yield rather than merely setting a nominal purchase target for QE. In all these respects, Keynes had a much greater understanding of the bond market – including the critical role of expectations - than today’s central bankers. The current FOMC has been content to announce an extension of its own, somewhat flawed QE, announcing last November that it would buy a further US$600bn of US Treasuries. Since then, sniping from hawks on the FOMC, a (modest) uptick in economic growth and an unseemly rush to extend tax cuts has sparked a huge sell-off in US Treasuries. And that has occurred just as the S&P/Case Shiller index for house prices is poised to break down to new bear market lows. Federal Reserve chair Ben Bernanke has been forced to admit that the economic recovery in the US is slow. It may well stall, precisely because the Fed chair, and much of the economic establishment, including New York Times commentator Paul Krugman (not to mention the departed, discredited Lawrence Summers and Chrisina Romer) simply do not ‘get Keynes’. One economist who clearly does is Geoff Tily. His book is based on a PhD thesis, supervised by Professor Victoria Chick at the University College of London. Professor Chick is one of a handful of economists who truly comprehends the importance of monetary affairs in Keynes’s work, and encouraged Geoff to write his thesis. Geoff provides clear evidence of the role Keynes played in driving the shift towards QE in the early 1930s, long before the General Theory was published. He also dissects the manner in which Keynes’s legacy was traduced by economists, both on the right and soft left in the post-war era, after his untimely death in 1946. This book is rigorous, and readers will be impressed by the comprehensive manner in which Geoff takes Keynes’s critics to task. It is not the sort of book that can be read in one quick swoop. It is a demanding read, because it is so thorough. It challenges many of the misconceptions over the policies pursued during the 1930s. For these reasons, this book helps to explain why the West has botched its response to the credit crunch. It seems to be fashionable now for leading figures inside central banks to issue mea culpas. Their statements are along the lines of: perhaps the bank bailout was wrong; the taxpayer shouldn't have bailed out the banks. Yesterday the Deputy Governor of the Bank of England, Paul Tucker, surprised a few people by saying "something has gone wrong with capitalism, with the very heart of capitalism". After the bank collapse of 2008 that can hardly be argued. However his remedy is that banks must be allowed to fail for capitalism to "work". Tucker is not coming over to some sort of progressive anti-bank position or becoming an advocate for regulation. Quite the opposite, he is echoing his counterpart on the Federal Reserve's FOMC (the US equivalent of the Bank of England's MPC), Charles Plosser, who epitomises the increasingly vocal, laissez-faire camp, which calls for an end to an active monetary policy to support economic recovery. "Successfully implementing such an economic stabilization policy requires predicting the state of the economy more than a year in advance and anticipating the nature, timing, and likely impact of future shocks. The truth is that economists simply do not possess the knowledge to make such forecasts." Well free market economists don't. Hence why Plosser was completely taken by surprise by the credit crunch of 2008. What underpins these public statements from Tucker and Plosser is not a mea culpa on behalf of the banking sector, but actually a coded hands-off warning: State intervention is out of fashion now, because it bank regulation is now on the agenda and because the rest of the economy might demand government support. Professor of Industrial Relations Roger Seifert said banks should be nationalised but the state would have to play an increased role in the long term to "regulate banking behaviour." "The short-term position would be to nationalise failing banks permanently then use them to encourage behavioural change in other banks through more progressive employment and lending policies, linked with community and government projects," he said. Left Economics Advisory Panel co-ordinator Andrew Fisher welcomed Mr Tucker's acknowledgement that "something had gone wrong with capitalism." But he added: "To let one of the big banks go bust would see millions lose their savings and tens of thousands lose their jobs. The Labour government was right to step in and nationalise. However, with that nationalisation should have come democratic public control with fair rates for savers and borrower alike and investment targeted at creating sustainable jobs. "While Tucker recognises the inherent flaws in the finance capital system, his free-market solution is the exact opposite of what any socialist would want." The Guardian today reports an amazing story today. The much debated 50% top tax rate, which came into effect in April 2010, has raised precisely £0 so far. Why's that (i hear you ask)? Has Will Hutton's Pay Commission enforced that no one should earn over £150,000? Don't be silly. Has the right-wing media prediction that all talent (aka overpaid people) will leave the country come true? No. In fact, the reason the new 50p tax band has raised not a penny is because HM Revenue & Customs only had one year to adapt its computer system to collect the tax. Apparently that is insufficient time. Seriously. "Although the new rate started in April 2010, you may be aware that you are only being taxed through the Pay As You Earn (PAYE) system at 40% on some of your jobs or pensions, rather than at 50%. We were unable to introduce the changes needed to PAYE to collect the 50% rate from people who had more than one job or pension for the tax year 2010/11. This is because the start date was brought forward a year to April 2010 by budget 2009." Corporation Tax is being reduced to 27% within a year, then 26% then next year, 25% the year after that and 24% the following year. I'm not a gambling man, but I'm willing to bet there's no delay in adapting systems to reduce tax for big business. "It defies belief that HMRC wasn't able to get its computer system geared up for this and it now means high earners will be getting away without paying their dues while ordinary taxpayers face a VAT rise and cuts in public services. "It also effectively gives the wealthiest taxpayers time to limit their tax liability, which would just add to the tens of billions of pounds that is avoided, evaded or uncollected every year. After a succession of embarrassing episodes, senior management need to get a grip and the government must see there is an alternative to cuts that have been so damaging to the department." The PCS website also puts the case for Barclays and KPMG today - and there's every reason to vote for either of these facilitators of 'tax shirking'. You can also vote for HMRC at: http://falseeconomy.org.uk/tax/hmrc. I just have - because the cuts in HMRC are the biggest gift to corporate and super-rich tax avoiders. The article is an extraordinary mix of lies, distortions and contradictions. It is clearly designed as an ideological primer for the ruling classes and their mouthpieces in politics and the media as they embark on this phase of crisis resolution. It provides carefully selected 'facts' from around the world, in an analysis designed to appeal to, and reinforce, anti-worker and anti-union prejudice. "The public sector ... is a haven of security and stability. Many people have jobs for life and performance measures are rare. The result is a paradox: the typical public sector worker is better off than the people he is supposed to serve ..."
"Public-sector unions enjoy advantages that their private-sector rivals [sic] only dream about. As providers of vital monopoly services, they can close down entire cities. And as powerful political machines, they can help to pick the people who sit at the other side of the bargaining table." "Unions have suppressed wage differentials in the public sector. They have extracted excellent benefits for their members. And they have protected underperforming workers from being sacked." "Generous pensions have produced an epidemic of early retirement." "The unions' influence extends to the size and nature of the public sector ... [They] are relentless in demanding more resources and more personnel, which conveniently translate into more members and more dues." "Public-sector unions combine support for higher spending with vigorous opposition to accountability." "Public-sector unions will find it hard to win these battles. They have not been particularly successful in mobilising public anger, considering the scale of the cutbacks." I only hope that we can prove them wrong. Voting has started to find the UK's biggest tax shirker. People can decide which corporation or individual has made the biggest contribution to the cause of robbing the poor to pay the rich. There is a shortlist of 10 on the False Economy website. Read the details behind the logos of the finalists – like Boots and Vodafone – and vote for the top shirker. There's also good reason to consider Barclays, which is being targeted by Right to Work. The poll is organised by False Economy, PCS, War on Want and the TUC. It highlights the fact that the public sector is being slashed while billions of pounds of tax is avoided, evaded, or uncollected. “It is a national scandal that tens of billions of pounds are being sucked out of our economy every year by some very wealthy people, particularly at a time when we are told cuts are unavoidable. “Every day brings a new revelation of yet another company failing to pay its tax dues. Now we learn that Barclays has more than 300 subsidiaries in tax havens, just as City bankers line up for their new year bonuses. The sight and sound of Barclays CEO Bob Diamond running rings around a committee of Westminster MPs should bring an end to the ideas that bankers’ bonuses can be controlled, that the financial sector can be regulated, or that the worst excesses of capitalism can be reined in. These are the ideas that have sustained the economic and political debate since the crisis blew up in 2007. Those tied to the for-profit economic model, which includes most parliamentarians, took their cue from rafts of self-styled “economists”, analysts, commentators. They had in various ways blamed the removal of regulation during the Thatcher/Reagan years for the gaseous balloons of dodgy credit that enveloped the world during the globalisation decades. Of course, the chorus of disapproval only started when the burden of mortgage and credit card debt became unsustainable and the payment defaults detonated the balloons’ volatile contents. Until then, the world was in thrall to New Labour’s friends in the City, and the Blair/Brown triumphalism that trumpeted “the end of boom and bust”. Diamond is pretty much the apotheosis of spokespersons for the capitalist class and he wasn’t pulling any punches when he said that the time for “remorse and apology” was over. In asserting that banks should be allowed to fail, he issued a sharp slap in the face for the whole process of bailing them out in the first place. This led governments and central banks around the world to massively expand their debt and pass the responsibility for repaying it on to their unwilling and increasingly unruly populations, their children and their children’s children, if the system is allowed to continue. And if banks should be allowed to fail, so, it seems, should the countries who’ve tried to bail them out, or have been caught up the global debt tsunami. Portugal is in line to follow Greece and Ireland. High bonus payments are a symptom of a problem, not its cause. The banking settlement was deficient because it did little to address the asymmetries in the universal banking business model. This model causes investment banks to jeopardise global financial stability in bad times whilst allowing bankers to cream off film star compensation in the good times. The global reforms have done a bit to improve financial stability but almost nothing to constrain the profitability that produces the bonuses. That profitability arises from a business model that gives banks in general and investment banks in particular the best possible view of global economies and markets. They are able to use this information advantage to load the dice and generate super-profits. This is where the bonuses come from and this is why the banking lobby worked so hard and so successfully to defend the model. The “business model” Augar is talking about is profitability. So now is the time to ask the question of questions: why do we need to organise the whole of society around the for-profit business model? The spectacular failures of the last three years are signs of a system at the end of its days. Rather than trying to prop it up, at an unbearable cost to billions of ordinary people, we must put it behind us, setting our minds to the future of a society that produces for the needs of everyone, not the bonus-yielding super-profits for a few. That is the agenda for a global network of People’s Assemblies. The government was urged today to overhaul its "impotent" attempts to prevent greedy bankers from lining their pockets with six-figure bonuses. Deputy Prime Minister Nick Clegg yesterday said that bankers' bonuses seem to be coming from "a parallel universe" as they prepare to pay out annual bonuses estimated to total £7 billion. He also echoed Prime Minister David Cameron in saying that state-owned banks such as Royal Bank of Scotland should be sensitive to taxpayers' concerns when awarding extra payouts after it emerged that the bank's chief executive was to receive a £6.8 million pay package. But both leaders have been accused of being all talk and no trousers in their pledges to rein in sky-high bankers' bonuses at a time of widespread cuts to pay and jobs. Left Economics Advisory Panel co-ordinator Andrew Fisher said: "The old adage that 'you can't control what you don't own' needs updating in light of this government's impotent attempts to control bankers' bonuses. "Attempts to cap pay or bonuses will prove futile unless the government sets bankers' pay and bonuses at these banks and it can't do that unless it takes control - something which is long overdue." Labour MP John McDonnell has recently tabled two early day motions on bankers' bonuses and executive pay, which calls on the government to "tackle this grotesque display of inequality and outrageous greed." High Pay Commission chairwoman Deborah Hargreaves said: "With banks preparing to pay multi-million pound bonuses, they are showing once again just how out of touch with the public mood they are. "Mr Cameron has called on the banks to pay smaller bonuses, but it is high time the government took action itself to stop this bonanza." She added that the coalition should follow the Irish government's lead and threaten to legislate against bonus payment at bailed-out banks unless they show restraint. Labour leader Ed Miliband has called on the government to extend the tax on bankers' bonuses which raised £3.5bn in 2010, claiming it was "unfair" that the government's banking levy would raise less than half that sum this year at a time when ordinary families struggle to cope with a VAT rise. The coalition government landed its latest body blow on Britain today with a VAT rise that critics warn will combine with brutal job cuts and rising inflation to create a perfect storm of misery for ordinary people. Multimillionaire George Osborne's tax rise on most goods and services from 17.5 per cent to 20 per cent - the highest rate in British history and among the highest in Europe - drew criticism from politicians, trade unions and economists on both the left and right. As the rise came into effect yesterday Mr Osborne boasted that it was a "necessary step towards Britain's economic recovery." The Chancellor says that the change will raise £13 billion a year. But Labour leader Ed Miliband accused Mr Osborne of "treating the British people like fools" and said that "everybody knows it's poor and middle-income families that will be hit hardest." Retailers themselves have warned that the measure will backfire and depress spending in high streets and drive inflation, which is already outstripping the bulk of pay rises for workers in Britain. The Chartered Institute of Personnel Development has predicted that the VAT rise, along with the government's spending cuts, will see more than 1.6 million jobs lost in both public and private sectors by 2016. CIPD chief economic adviser John Philpott warned last year that 250,000 private-sector jobs losses will come from the VAT rise alone. The cost of basics such as petrol, food and clothing all rose, as did everyday luxuries such as beer - with the GMB union warning that the rise puts thousands of pubs at risk. Left economists told employers to expect rising anger among ordinary people hit by rising prices and lower incomes. "Combined with above-inflation fare increases, the public-sector pay freeze and welfare cuts there will be a real squeeze on spending again this year, which will inevitably increase demands for higher pay settlements," said Left Economics Advisory Panel co-ordinator Andrew Fisher. "Pay will therefore increasingly become the central issue for industrial disputes. "The profitability of Britain's corporate sector is at near record levels and this VAT rise could easily be absorbed by retailers. "Instead however they will pass on the costs to the public through higher prices and potentially job cuts in the retail sector." Trade unionists argued that far more than £13 billion could be saved from targeting tax avoidance by big businesses. TUC general secretary Brendan Barber said: "Raising VAT, while failing to tackle the tax loopholes exploited by big businesses means that ordinary people will soon pay a higher rate of tax on purchases and earnings than the banks pay on their profits." And Communist Party of Britain general secretary Rob Griffiths called for a windfall tax on the super-profits of retail, pharmaceutical, banking and energy monopolies. Even Professor Philip Booth of the pro-business Institute of Economic Affairs argued: "If the government insists on increasing taxes there are better candidates than a general VAT rise."